Above and Below Images by Adrian Boddy, All Rights Reserved. Copyright Johnson Bros. Mitre 10 and JBH Timbers, 2011. All Rights Reserved. Hi and welcome to Johnson Bros Mitre 10 DIY Tips. 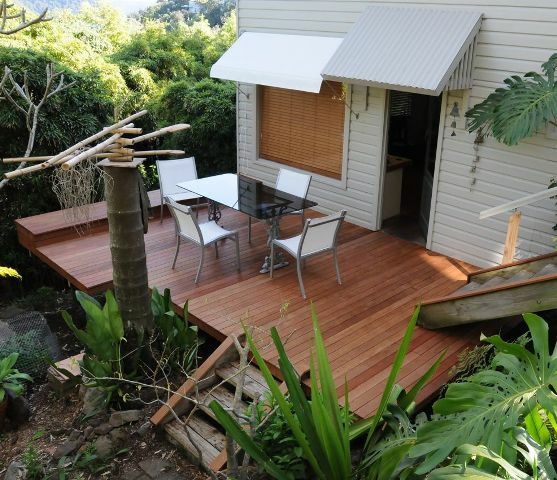 The last two articles have dealt with selecting your timber for your deck and preparing the decking for finishing. This week’s article will look at the various types of finishes available for external decking, and their pros and cons. Most decking finishes either penetrate the timber or leave a coating on the surface, (some of the latest products do both) and are either solvent based or water based. Nearly all external decking finishes have some form of pigmentation which acts as a U.V. inhibitor. If there wasn’t this pigmentation, the decking finishes would be broken down very quickly by the sun’s UV rays. This would mean constant maintenance. A lot of the deck finishes offer a choice of pigmentation colours. Up until a few years ago, the vast majority of deck finishes were solvent based. Most decking oils are solvent based and protect the timber by penetrating the surface and revitalising the fibres. 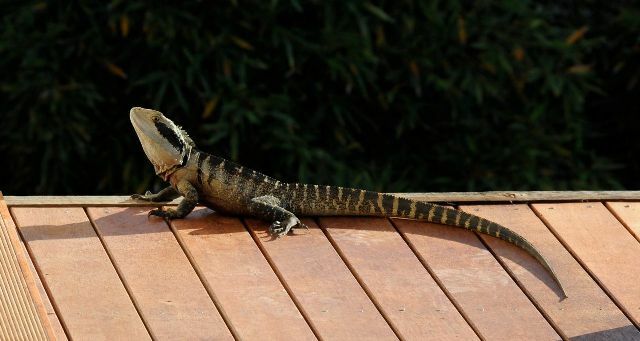 These products usually don’t last as long as similar water based products, however, decking oils are recommended on timbers with high natural oil content such as Tallowood and Spotted gum. Using the latest technologies, water based products are becoming more popular as they are easier to clean up, are longer lasting and have quicker recoat times than the solvent base decking oils. Quicker recoat times now mean that once your preparation has been completed, a deck can have 2 coats of finish applied over one day! Water based products also tend to be more environmentally friendly as they have lower VOC’s. Some of the water based products available are Cabots Aquadeck, Intergrain Ultradeck and Intergrain Natural stain. Cabots Aquadeck and Intergrain Ultradeck penetrate and nourish the timber whilst also leaving an acrylic film on the surface to offer further protection. Products which offer a longer lasting finish work on building a coating on the surface of the timber. These include Sikkens Deck, Sikkens Deck Plus and Intergrain DWD. The DWD is water based, whilst the Sikkens products are solvent based and require clean up with mineral turpentine. They do however offer a long lasting finish, and if they are maintained correctly, will save you money over the life of your deck. These products initially are more expensive as they require a primer coat first, then the finish coats. They also require a lot more care in application as they rely on the thickness of the coating to offer the protection, so please follow the directions on the cans! The Sikkens Deck Plus has a slip resistance added to the product, this is especially good for walkways and ramps, and also any deck to minimise the chance of injury through slipping. Intergrain Ultragrip can be added to most products to give this same slip resistance. All of these products mentioned are available at Johnson Bros Mitre 10, with some of the lowest prices on the peninsular. Come in and talk to our helpful staff for more information and advice. From the management and staff of Johnson Bros, we wish everyone a safe and happy Christmas and New Year.